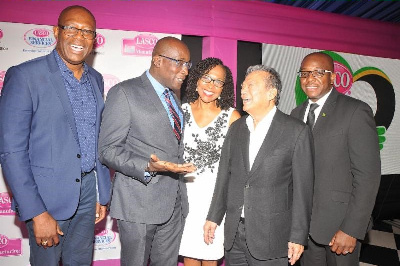 LASCO Chin Foundation Launched with Fundraising Galas Planned for Florida - LASCO Financial Services Ltd.
KINGSTON, Jamaica – LASCO Chin Foundation (LCF), which officially unveiled at a press breakfast on Thursday, September 20, 2018 at the Terra Nova All-Suites Hotel Venetian Suite, will host its first fundraisers in Florida. The Inaugural Benefit Gala will be hosted in Orlando and Miramar over the weekend of Friday, November 16 and Sunday, November 18, 2018 respectively. Venued at Rosen Plaza Hotel in Orlando and Miramar Cultural Centre the fundraisers will have keynote addresses by the Most Hon. P.J. Patterson, former Prime Minister of Jamaica, and Senator the Hon Ruel Reid, Minister of Education, Youth and Information is a special guest. Both galas are being hosted with the support of the Jamaica Diaspora Education Task Force (JDETF). Chairman of the Foundation, Founder and Executive Chairman of the LASCO Affiliated Companies Hon Lascelles A. Chin, O.J, C.D, LLD said it was always his life’s dream to help Jamaica.